Nepali Congress leader Sher Bahadur Deuba is the sole candidate to contest in the prime ministerial election as the opposition parties did not send their candidates. Sher Bahadur Deuba will succeed Pushpa Kamal Dahal Prachanda as Nepal's Prime Minister if elected. Kathmandu: Nepali Congress or NC President Sher Bahadur Deuba is set to become the Himalayan nation's prime minister for the fourth time after the main opposition party decided to end the obstruction of parliament. Nepal parliament is conducting election to the post of the prime minister today. Mr Deuba, 70, is the sole candidate to contest in the prime ministerial election as the main opposition UML and other parties did not send their candidates. Mr Deuba has the support of more than 50 per cent lawmakers needed for his election to the top post. He needs to secure 297 votes in the 593-strong parliament to prove his majority during today's election. With the Nepali Congress-Maoist Centre alliance having 287 seats in parliament and four other parties supporting the alliance with 21 seats, it looks plain sailing for Mr Deuba. The election was postponed since Sunday after the main opposition CPN-UML launched a protest over re-election in a ward. 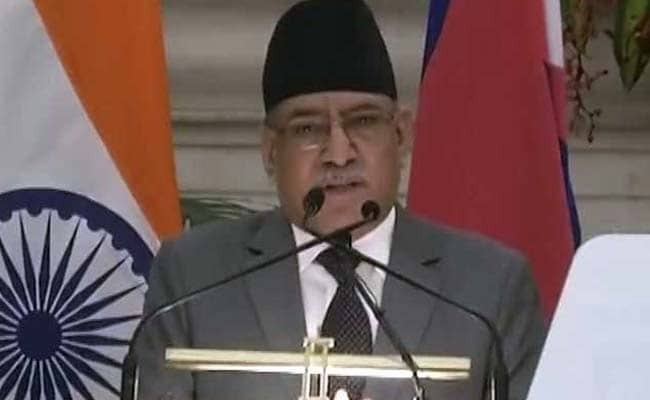 However, now with the opposition party agreeing to end obstruction of parliament, the NC president is set to become the Himalayan nation's 40th prime minister. The CPN-UML decided to end House obstruction after the ruling parties agreed to hold local election in the remaining four provinces on June 28 and the provincial and parliamentary elections by January 2018. "We decided to end the obstruction in parliament after the ruling parties agreed to commit in the house to hold elections in the remaining four provinces and not repeating any irregularities," said former UML chairman Jhal Nath Khanal after the meeting between the government's ministers and opposition leaders. Under Nepal's constitution, a candidate must secure a simple majority in parliament to get elected as the head of the government. The CPN-Maoist Centre, Madhesi Peoples Rights Forum Democratic, Rastriya Prajatantra Party and other small parties have agreed to vote in favour of Mr Deuba. He is likely to form a small cabinet tomorrow, which will be expanded in a few days. Some Madhesi parties are also likely to join the coalition. The responsibility of conducting the second phase of local elections will rest on Mr Deuba. Outgoing Prime Minister Prachanda of the CPN (Maoist Centre) proposed Mr Deuba's candidacy while NC leader Ram Chandra Poudel seconded the proposal at the Parliament Secretariat, which last week published the schedule to elect the prime minister on a majority basis. Mr Prachanda resigned on May 24 after a brief stint of nine months, honouring a power sharing understanding with the ruling coalition partner Nepali Congress to hand over the country's leadership to the largest party in parliament. Mr Deuba served prime minister from 1995 to 1997, from 2001 to 2002, and from 2004 to 2005. He was sacked by the then King Gyanendra Shah in 2005 over failure to hold elections and bring Maoist rebels to a roundtable negotiation.